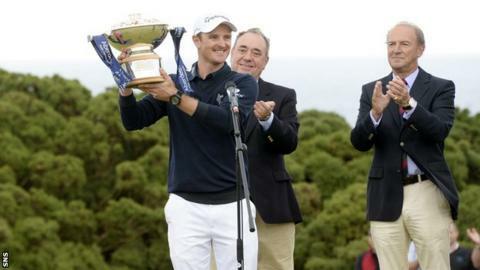 England's Justin Rose won the Scottish Open at Royal Aberdeen after carding a six under 65 for a 16-under total. Swede Kristoffer Broberg (66) finished second on 14 under, securing a spot at next week's Open at Hoylake. Home favourite Scott Jamieson (64) and Englishman Tyrrell Hatton (68) will join him after finishing in the top 10. Marc Warren shared the overnight lead with Rose but his challenge faltered and he ended third after a 70 for 11 under overall. Scot Stephen Gallacher carded a course record-equalling 63 to finish tied for fourth on 10 under, alongside Matteo Manassero (65), Shane Lowry (66) and Hatton. Jamieson finished tied for eighth on nine under with American Rickie Fowler (65) and Sweden's Robert Karlsson (66). Defending champion Phil Mickelson (65) was a shot further back. A 67 ensured day one leader Rory McIlroy finished on seven under. Rose's faultless final round, including six birdies, ensured he was in the 60s in all four of his rounds this week. "It's a privilege to win this great championship," he said. "This is my first professional win in Scotland so it means a lot. "This is a great tournament - there's definitely something special about playing golf up here and the golfing crowd are so knowledgeable - I've really got to love this course." Meanwhile, Warren was happy with his form ahead of the Open at Hoylake, and paid tribute to playing partner Rose. "It was another great Scottish Open experience for myself," he said. "On the front nine today, my ball striking was up there with what it's been all week but my putting went cold. Justin was the opposite, he seemed to be putting from outside me all the time but holing them. "Justin was absolutely clinical. He's a cool customer and a great front-runner." Gallacher's eight-under total for the day, which included nine birdies and one bogey, matched the earlier round of Chilean Felipe Aguilar, who finished on four under. "I'm delighted with that, it was a great round today, I've played great all week and it was nice to hole a few putts," Gallacher told BBC Radio Scotland's Sportsound. "I'm looking forward to taking that form into Hoylake next week."